OFRI Executive Director Erin Isselmann, center, joins OFRI board chairman Quincy Powers, left, and Giustina Resources' Pete Sikora, right, on a forest tour near Eugene. My first month as the new executive director of the Oregon Forest Resources Institute has been a whirlwind of meetings, introductions and getting up to speed on Oregon’s forest sector. There has been a lot to learn. It is a completely new world to me. I come to OFRI with more than 20 years of experience in marketing and communications, primarily in the high-tech industry. I began my career in Oregon at a company called Tektronix, which many consider the founder of the Portland metro area’s “Silicon Forest” of tech companies. At that time, my focus was on a little-known, Oregon-developed printing technology called solid ink. Our mission was to raise awareness about this new color printing technology and speed up the transition from black-and-white to color printing. We did such a great job that in January 2000, the color printing division of Tektronix was acquired by Xerox Corporation, and I started working for them. Xerox provided me with great opportunities to grow my skills and experience in areas such as global public relations, corporate website marketing and forming the company’s first social marketing practice. Now I have the opportunity to use my expertise at OFRI to guide the public education and awareness effort for one of Oregon’s most valuable resources and treasures: our forests. In my short time as OFRI’s executive director, I have met some wonderful people who care deeply about forestry in Oregon. They include landowners, foresters, loggers and mill workers. Each and every person I have met has a deep personal connection and commitment to the stewardship of Oregon’s forests, and the protection of wildlife and clean water. That dedication and alignment to sustainable forest practices, across the sector, sets this industry apart. I’m looking forward to helping share that story in Oregon and beyond. The newly completed lobby of First Tech Federal Credit Union's Pacific Northwest corporate office in Hillsboro. 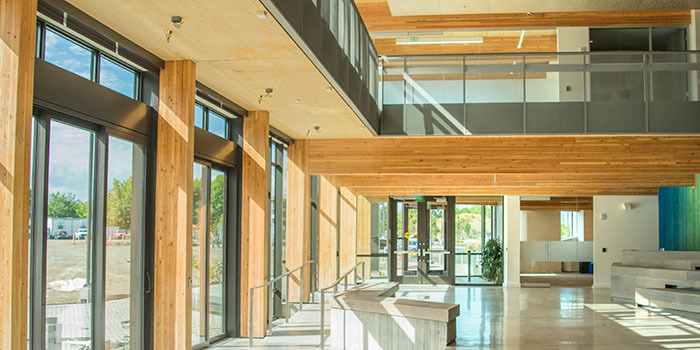 The 156,000-square-foot cross-laminated timber (CLT) building is among a growing number of commercial structures being built with CLT in Oregon. Oregon State University’s foray into mass timber hit a speed bump this spring, but construction of a signature building using innovative wood products technology is back on track and scheduled for completion in the fall of 2019. On March 14, a cross-laminated timber (CLT) panel installed at Peavy Hall, the future home of the OSU College of Forestry in Corvallis, delaminated; two of the seven layers of lumber that made up the panel fell to the ground. No one was hurt, and all parties involved in the incident did the right thing. OSU stopped construction on the two-building project, officially called the Oregon Forest Science Complex, and hired an engineering firm to analyze the structure for any other potential failures. The manufacturer, Riddle, Ore.-based D.R. Johnson, investigated its role. Turns out there was an unauthorized change to the production protocols for a short period of time at the facility where lumber is glued together in alternating directions to create the CLT panels. This resulted in the production of some panels with weak adhesive bonds. Engineers zeroed in on the problem and corrected it. To be safe, the project’s general contractor then identified all panels that might have been affected, and is now completing the process of replacing them before moving ahead with construction. Problem solved. Is this a major hurdle in the rapid adoption of CLT and other advanced wood products in commercial construction, or a minor hiccup? Actually, it’s whatever falls below a minor hiccup. When this event occurred, virtually everyone involved in the production and use of CLT and other advanced wood products heard about it. In the five months since, those same people have been moving forward, undeterred. Defects happen. They get corrected, and life moves on. You might think the manufacturer’s customers would be taken aback by the incident. But, again, not the case. They’re still running two shifts at the plant and filling an order sheet that stretches through next spring, shipping panels to customers up and down the West Coast. Some thought developers and builders would be hesitant, but they too are undaunted. Today there are at least five large new buildings being constructed in the Portland area using CLT as part of the structural system. At least a half-dozen more are in the planning stage and very likely to be built. Quite a few others are underway in California and Washington, and plenty more across the country. In April, at the International Code Council’s Committee Action Hearings, 14 proposed amendments to the International Building Code – which collectively would allow for much larger and taller wood buildings – passed overwhelmingly. During the hearing those opposed to the amendments could have cited the Peavy Hall incident as a reason to vote the proposals down, but they didn’t. Likely, they too understood that manufacturing defects can occur with any product. In recent months, Oregon-based Freres Lumber Co. opened a new manufacturing plant in Lyons that makes mass timber panels using wood veneer, the raw material that goes into plywood. The facility earned its PRG-320 certification last month, allowing it to begin marketing panels for structural use in similar applications as CLT. At least five other U.S. mass timber plants, including two in eastern Washington (one in Colville and the other in the Spokane Valley) have broken ground. - By code, it must meet the same fire and seismic requirements as concrete and steel. - It’s an elegant building solution that serves as the structure, fireproofing and finish, all in one. - Wood has better aesthetics than fireproofed steel, including a warm, natural feel. 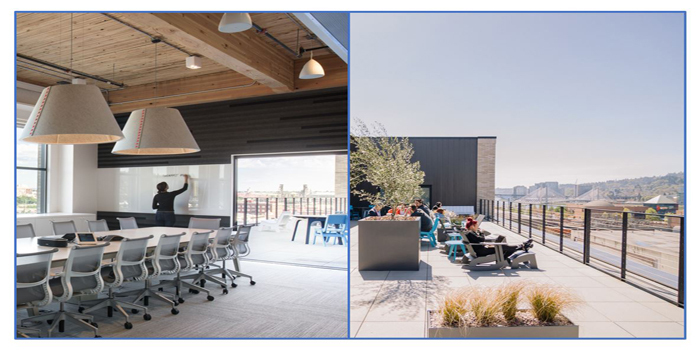 - Mass timber construction helps attract and retain the best staff by creating a distinctive work environment. - Projects finish faster than conventional construction, and can be less expensive in comparison to constructing the same building with steel or concrete. - Mass timber offers a structural solution that supports local industry and rural economies. - Wood construction is sustainable. It’s a renewable resource that comes from sustainably managed forests here in Oregon. Wood stores carbon and requires less energy to produce than steel or concrete. Many building owners, developers, architects and contractors are coming to these same conclusions. On August 1, the Oregon Building Codes Division made it much easier for all of them to use advanced wood products by publishing a Statewide Alternative Method (SAM) for building wood structures in Oregon up to 18 stories and 270 feet tall. That SAM, which took effect immediately, provides a prescriptive path for permitting that does not exist in any other state. That will make it easier for developers to achieve greater value in their projects using wood. It will go a long way toward accelerating the momentum of the growing mass timber movement. There may be a few blips along the way, but it’s certain that Oregon will see a lot more wood buildings going up in the coming months and years. And for many good reasons. Sure, let’s go looking for bears! 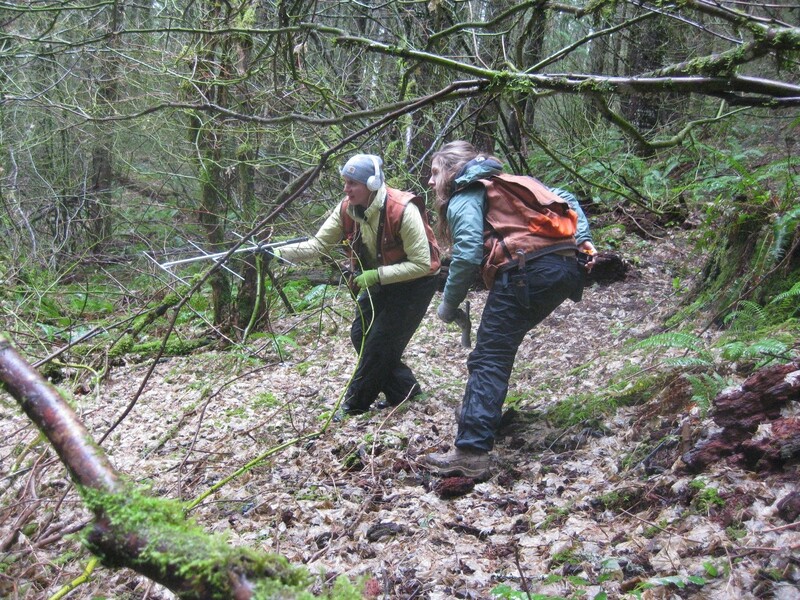 Vanessa and her field technician using radio telemetry to check out a potential den site. It was a misty winter in Oregon when we headed out in search of the female black bear and her cub in a western Oregon forest actively managed for timber production. Our purpose was to locate the bear in her den and document the den’s conditions – presumably without getting mauled. 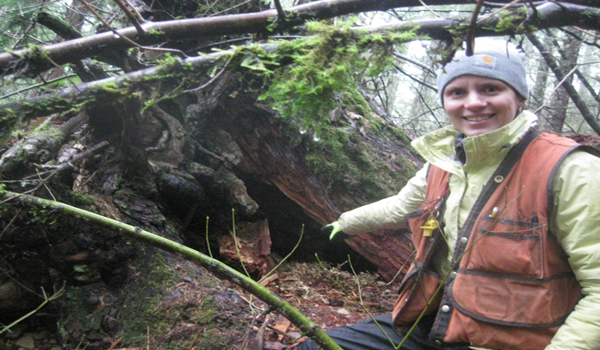 Vanessa is studying bear habits in managed forests to learn why some of the estimated 25,000 to 30,000 bears that live in Oregon peel Douglas-fir trees. When they do, the damage kills Douglas-fir trees. This can cause a significant economic loss to forest landowners who planned to harvest the trees for timber. Peeling appears to be a learned behavior that bears teach their young, but not all bears peel. Thanks to the work of researchers like Vanessa who are gathering more information, wildlife biologists might be able to predict where tree peeling could occur and perhaps find a way to manage bears in a way to discourage peeling. But there’s a lot more to learn before we reach that point. My day in the field with Vanessa was exciting, and we did locate the bear and her cub. The entire time after getting out of the truck to track the bear in the forest using radio telemetry we had to be absolutely silent. As a rather chatty person, this was very difficult for me. I kept thinking of all kinds of questions and had lots of thoughts about what people would think about trying to sneak up on a mother bear and her cub all while we hiked as silently as possible through the woods toward a rather sleepy mother black bear with her cub. I stayed several steps behind Vanessa and her wildlife technician, who was, after all, carrying the bear spray. We checked several potential sites. Then finally we located the bears! It happened so fast that I missed seeing the mother bear, but I did see a sleepy cinnamon-colored black bear cub stumble over a log and follow its mother to another den location. We documented the den location, snapped a few pictures and then high-tailed it out of there. Admittedly, I looked over my shoulder a few times on the way out, but we weren’t followed. I’m sure the bears returned to their den. Vanessa points to the den where we located the female black bear and her cub. On the car ride home, I reflected about the day. I learned so much from Vanessa. There are so many wildlife and forestry interactions, and they are complex. The biggest take-home for me was it is important to understand how wildlife are using their habitats so that we can manage for them in a way to promote them. It’s all part of sustainable forest management. He’s right. Mass timber is new building technology. There’s fear of the unknown and that fear manifests in budget estimates. Realizing the full potential advanced wood products bring means approaching construction projects with a collaborative approach, rather than the traditional siloed approach, and not all project teams are comfortable working that way. William Silva with Swinerton likens working with mass timber to the days of the “master builder.” Hundreds of years ago, the world’s iconic buildings, including the cathedrals and castles of the Middle Ages, were largely the work of a master builder who had expertise in architecture, engineering, materials science and construction methods, and brought that blend of experience to each project. Today, no one person is likely to be an expert in all areas of design and construction. But you can bring the experts together and approach projects with a collective mind. This uncovers a range of efficiencies that help drive down the overall costs of a project. That approach worked for Swinerton. This month the general contractor is completing the largest cross-laminated timber (CLT) structure in the U.S. months earlier and 4 percent less expensively than if it had been built with steel, as originally conceived. The headline of this blog was the title of a presentation given last month at the Eastern Oregon University Mass Timber Rising Summit in La Grande. Mike Bradley, with Beacon Builders in Spokane, Wash., described an 8,000-square-foot CrossFit gym he built with CLT at a cost of $110 per square foot, which is a very good price for that type of project. He said the structure went up in just four weeks with no skilled labor. At the International Mass Timber Conference last March in Portland, I heard Todd Wilson, an architect and developer from New York City, describe in detail how he saved nearly $500,000 in construction costs on a small office project in Brooklyn, N.Y., by using CLT instead of reinforced concrete. That, combined with interest savings on his construction loan due to the building going up faster, and increased year one revenue due to it leasing up faster, brought the overall savings to $1.3 million to $1.7 million. To me, saving a million and a half bucks on a construction project sounds like winning the lottery. None of this is all that surprising to me. In fact, it mirrors what I heard in England when I visited there in late 2016. The British architects and contractors I met told me that, for a variety of reasons, on the majority of construction projects, timber was the lowest cost solution. As advanced wood products supply chains become more mature, and as more architects, engineers and contractors learn how best to benefit from all the advantages mass timber construction has to offer, it seems the same thing is also rapidly becoming true here.